School Yourself: How often do students guess their way through? How often do students guess their way through? 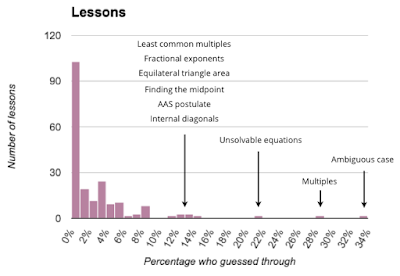 When designing online courses, like AlgebraX and GeometryX, a common cause for concern is that students can just "guess their way through" lessons and assessments. They're either totally lost, or not paying much attention, but they can still advance and get credit by brute-forcing their way. This can be very problematic for the student (who is grinding away without really learning) and the course (which loses credibility when this type of student behavior is common). So here at School Yourself, we've been asking ourselves: 1) How often does this happen in our courses, and 2) What can we do about it? 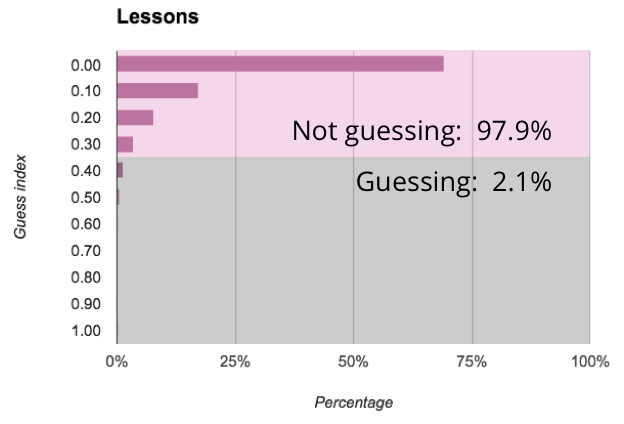 To figure out how often students guess their way through lessons, our team developed a formula we call a student's guess index. It's a number between 0 and 1, where a greater number means the student is probably guessing. A student's guess index takes into account the question type (guessing on a multiple choice question vs. an algebraic question are handled differently), number of attempts, what students do between attempts, and a few other factors. Over time (and with lots of student data) we have found that a guess index of greater than or equal to 0.4 means a student probably guessed their way through a lesson. An index of 0.2 or 0.3 means they might have struggled through parts of the lesson, but they worked throughout without resorting to guessing. And an index of 0 or 0.1 means they confidently proceeded through the lesson. 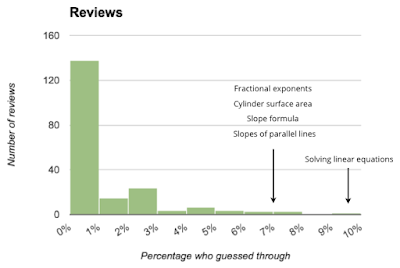 Students seem to guess their way through reviews less than 1% of the time. It's a little comforting to know that students guess less on reviews than they do in lessons, since the reviews are what hold them accountable for their knowledge. One or two guessing students out of a hundred may not sound too shabby. Indeed, these numbers are likely so low because 1) we prefer asking open-ended questions (with interactive graphs, algebraic expressions, numerical, or short answer) where possible, to ensure students understand what they're doing, and 2) our lessons are built around continuous, step-by-step user interaction, where the questions never get too far ahead of the students. But even though relatively few students are guessing, these are also the very students who need the most help! So now that we can precisely measure guessing behavior, what can we do to mitigate or prevent it? First, it's helpful to know whether students are guessing at similar rates across all lessons and reviews (indicating a problem with the overall course design, question types, etc. ), or if the guessing behavior is concentrated among certain lessons. 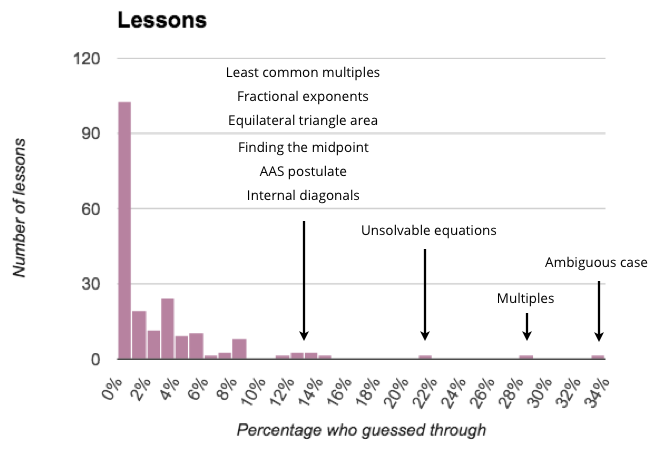 Half of the lessons exhibited zero guessing behavior, And guessing is concentrated among a handful of lessons, like Ambiguous case, Multiples, and Unsolvable equations. This is great news, because we can focus our attention on these lessons, see where students are guessing the most, and update the lessons (and add new branches providing feedback for common wrong answers). 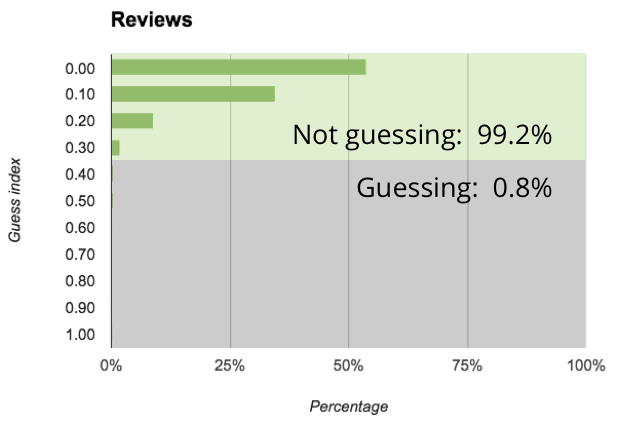 The majority (69%) of reviews had zero guessing. 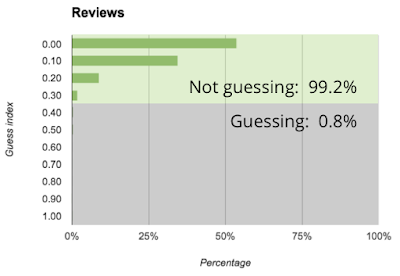 And once again, it's a handful of reviews that are the most conducive to guessing. So that's where we'll focus our efforts. So while students guessing their way through lessons doesn't seem to be a major problem for our content, it's something we can mitigate by focusing our effects on the most guess-prone lessons and reviews. Is there a way to check and see if my child is guessing he way through? Is there a tracking or other wise way to see his progress through in a teacher mode or something?